(Erin Alberty | The Salt Lake Tribune) George Clinton and Parliament Funkadelic perform for Outdoor Retailer show attendees at a party Jan. 25, 2018 in the Temple Nightclub in Denver. (Erin Alberty | The Salt Lake Tribune) U.S. Sen. Michael Bennet, D-Colorado, poses with a fan during a public lands discussion at the Outdoor Retailer show Jan. 27, 2018 at the Colorado Convention Center in Denver. (Erin Alberty | The Salt Lake Tribune) A bartender serves samples of Tincup whiskey, at the Outdoor Retailer show Jan. 26, 2018 at the Colorado Convention Center in Denver. (Erin Alberty | The Salt Lake Tribune) Outdoor Retailer attendees enjoy beer and reach for a free T-shirt sailing over the crowd at the massive trade show Jan. 27, 2018 at the Colorado Convention Center in Denver. (Erin Alberty | The Salt Lake Tribune) George Clinton and Parliament Funkadelic perform for Outdoor Retailer show attendees at a party Jan. 25, 2018 in the Temple Nightclub in Denver. (Erin Alberty | The Salt Lake Tribune) U.S. Sen. Michael Bennet, D-Colorado, speaks during a public lands discussion at the Outdoor Retailer show Jan. 27, 2018 at the Colorado Convention Center in Denver. (Erin Alberty | The Salt Lake Tribune) George Clinton and Parliament Funkadelic perform for Outdoor Retailer show attendees at a party Jan. 25, 2018 in the Temple Nightclub in Denver. (Erin Alberty | The Salt Lake Tribune) A bartender serves samples of Tincup whiskey, at the Outdoor Retailer show Jan. 26, 2018 at the Colorado Convention Center in Denver. (Erin Alberty | The Salt Lake Tribune) George Clinton and Parliament Funkadelic perform for Outdoor Retailer show attendees at a party Jan. 25, 2018 in the Temple Nightclub in Denver. (Erin Alberty | The Salt Lake Tribune) Outdoor Retailer attendees enjoy beer and reach for a free T-shirt sailing over the crowd at the massive trade show Jan. 27, 2018 at the Colorado Convention Center in Denver. (Erin Alberty | The Salt Lake Tribune) George Clinton and Parliament Funkadelic perform for Outdoor Retailer show attendees at a party Jan. 25, 2018 in the Temple Nightclub in Denver. (Erin Alberty | The Salt Lake Tribune) U.S. Sen. Michael Bennet, D-Colorado, speaks during a public lands discussion at the Outdoor Retailer show Jan. 27, 2018 at the Colorado Convention Center in Denver. (Erin Alberty | The Salt Lake Tribune) George Clinton and Parliament Funkadelic perform for Outdoor Retailer show attendees at a party Jan. 25, 2018 in the Temple Nightclub in Denver. 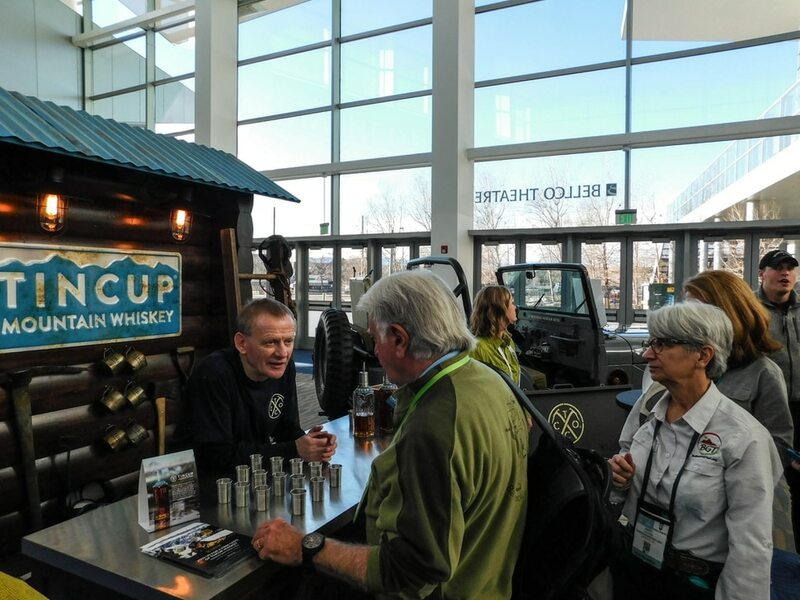 (Erin Alberty | The Salt Lake Tribune) A bartender serves samples of Tincup whiskey, at the Outdoor Retailer show Jan. 26, 2018 at the Colorado Convention Center in Denver. (Erin Alberty | The Salt Lake Tribune) George Clinton and Parliament Funkadelic perform for Outdoor Retailer show attendees at a party Jan. 25, 2018 in the Temple Nightclub in Denver. (Erin Alberty | The Salt Lake Tribune) George Clinton and Parliament Funkadelic perform for Outdoor Retailer show attendees at a party Jan. 25, 2018 in the Temple Nightclub in Denver. (Erin Alberty | The Salt Lake Tribune) George Clinton and Parliament Funkadelic perform for Outdoor Retailer show attendees at a party Jan. 25, 2018 in the Temple Nightclub in Denver. (Erin Alberty | The Salt Lake Tribune) George Clinton and Parliament Funkadelic perform for Outdoor Retailer show attendees at a party Jan. 25, 2018 in the Temple Nightclub in Denver. (Erin Alberty | The Salt Lake Tribune) George Clinton and Parliament Funkadelic perform for Outdoor Retailer show attendees at a party Jan. 25, 2018 in the Temple Nightclub in Denver. (Erin Alberty | The Salt Lake Tribune) George Clinton and Parliament Funkadelic perform for Outdoor Retailer show attendees at a party Jan. 25, 2018 in the Temple Nightclub in Denver. (Erin Alberty | The Salt Lake Tribune) George Clinton and Parliament Funkadelic perform for Outdoor Retailer show attendees at a party Jan. 25, 2018 in the Temple Nightclub in Denver. (Erin Alberty | The Salt Lake Tribune) George Clinton and Parliament Funkadelic perform for Outdoor Retailer show attendees at a party Jan. 25, 2018 in the Temple Nightclub in Denver. (Erin Alberty | The Salt Lake Tribune) George Clinton and Parliament Funkadelic perform for Outdoor Retailer show attendees at a party Jan. 25, 2018 in the Temple Nightclub in Denver. (Erin Alberty | The Salt Lake Tribune) George Clinton and Parliament Funkadelic perform for Outdoor Retailer show attendees at a party Jan. 25, 2018 in the Temple Nightclub in Denver. With Outdoor Retailer’s first run in Colorado generally considered a success, organizers say the massive trade show is expected to bring more than twice as much money as it did to Utah. Emerald Expositions estimated 85,000 people and $110 million will come to Colorado this year over the course of three conventions: the winter and summer shows, previously held for 20 years in Salt Lake City, and a new fall show in November. That far exceeds the $45 million and 51,000 visitors Utah was receiving annually from the shows when organizers severed their contract in Salt Lake City last year after public lands disputes between outdoor industry leaders and Utah’s Republican state and congressional officials. SnowSports Industries America, whose SnowShow merged with Outdoor Retailer for the joint show that began last week in Denver, on Tuesday wrapped up its two-day product demo event at Colorado’s Copper Mountain resort. Denver has secured Outdoor Retailer shows through 2022, and with so many structural changes to the events, it’s unclear whether Salt Lake City will ever be able to make a strong bid to recover them — especially now that major reductions to two of Utah’s national monuments have left outdoor industry leaders more furious with Utah than ever. ”Salt Lake City was a great home for Outdoor Retailer for many years, but we would need to see some significant changes before being able to consider the venue for the future,” said Darrell Denny, executive vice president of Emerald Expositions. In Salt Lake City, the Winter Market had about 22,000 attendees, slightly larger than the 17,000-strong SIA show it merged with in Denver. Although some companies had been attending both shows, the new merged convention appears to be larger than either show was last year. But it’s unclear by how much; Emerald Expositions would not release a head count. Some attendees questioned whether the show had room to grow in Salt Lake City. A few recalled scrambling for lodging in winter, especially when the show coincided with the Sundance Film Festival. For the summer show, which was even larger than the winter show, tents were erected across the street from the Salt Palace Convention Center to house the 1,500 exhibitors. Nonetheless, the merger of the winter shows was “long overdue,” said Jon Fewster, of Madshus Nordic skis in Seattle. SIA approached Outdoor Retailer on the same day as an acrimonious phone call last year between industry leaders and Gov. Gary Herbert over the state’s push to rescind Bears Ears National Monument. Moments after Herbert told the show’s organizers, “We’re going to have to part ways,” Outdoor Retailer announced it was leaving Salt Lake City — and SIA offered to merge the two shows in Denver. Emerald Expositions sealed the deal in May when it acquired the SIA show, neutralizing a noncompete agreement that could have prevented Denver from luring the Outdoor Retailer events. While industry leaders focused on the unified political statement against Utah, Fewster and other exhibitors noted other benefits to the merger. Several vendors were duplicating costs to attend both shows — which lately are functioning less as a marketplace, where stores finalize product orders, and more as a hub for networking, brainstorming, public policy advocacy and socializing. Several Outdoor Retailer veterans observed that the social element had ramped up with the addition of SIA, whose attendees trend younger and closer to the industry’s adventurous extremes. “It’s really like a giant party,” said Jeremy Pazzaneze, product manager for Deviation Ski and Snowboard Works in Portland, Ore.
Utah, with its complicated drinking laws and conservative cultural streak, might seem an unnatural fit for that — especially compared with Denver’s robust nightlife and pot dispensaries scattered around the city. 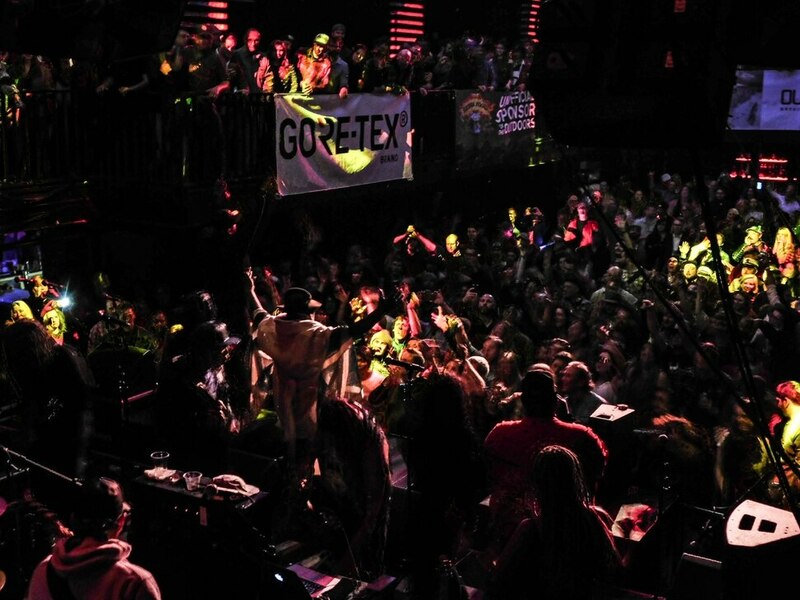 On the first night of the show, hundreds of attendees crowded into the Temple Nightclub to watch a free, private show by George Clinton and Parliament Funkadelic, sponsored by Gore-Tex. Businesses around Denver hosted parties nightly, and crowds lined up at the Tincup Whiskey booth for the show’s first whiskey samples. “This vibe! There’s so many more people,” Shelly Smith, spokeswoman for Granite Gear, said as a crowd clamored for prizes and tin cups of beer during a conservation fundraiser at the Minnesota backpack maker’s booth at the Colorado Convention Center. But of the dozens of show attendees interviewed by The Salt Lake Tribune, none strongly preferred Denver as a party town, and several fondly remembered concerts and events in Salt Lake City during Outdoor Retailer shows. The much-touted proximity of Utah’s ski resorts to the Salt Palace may have been an overstated advantage over Denver. For several years, SnowSports Industries America has operated a two-day gear demo at Copper Mountain resort, 90 minutes from the convention center, said Todd Walton, an SIA spokesman. A number of gear exhibitors at Outdoor Retailer’s annual demo days in the Wasatch Mountains also had gone to SIA’s events at Copper Mountain, so the overnight trip in Colorado this year isn’t an adjustment for them, he noted. And while retailers have reported the product testing to be “incredibly worthwhile,” Walton said, vendor participation at demo days in both Denver and Salt Lake City has represented a relatively small portion of the show’s attendance. About 170 brands of the 1,145 listed in this year’s show program also exhibited at Copper Mountain. Still, a few attendees last week said they missed Salt Lake City’s easy access to mountains, for ski meet-ups with business contacts and for their own vacationing. But the show’s return appears unlikely. The stated reason for leaving Utah — outdoor industry disapproval of the state’s politics on public lands — has only been reinforced. President Donald Trump in December ordered drastic reductions to Bears Ears and Grand Staircase-Escalante national monuments. The new boundaries divide the two monuments into five smaller monuments and eliminate half the land previously protected in Grand Staircase and 85 percent of Bears Ears. Colorado politicians seized on Utah’s rebuff. Nearly a third of Colorado’s legislature, the General Assembly, toured the convention floor to welcome exhibitors and speak with Colorado brand reps. 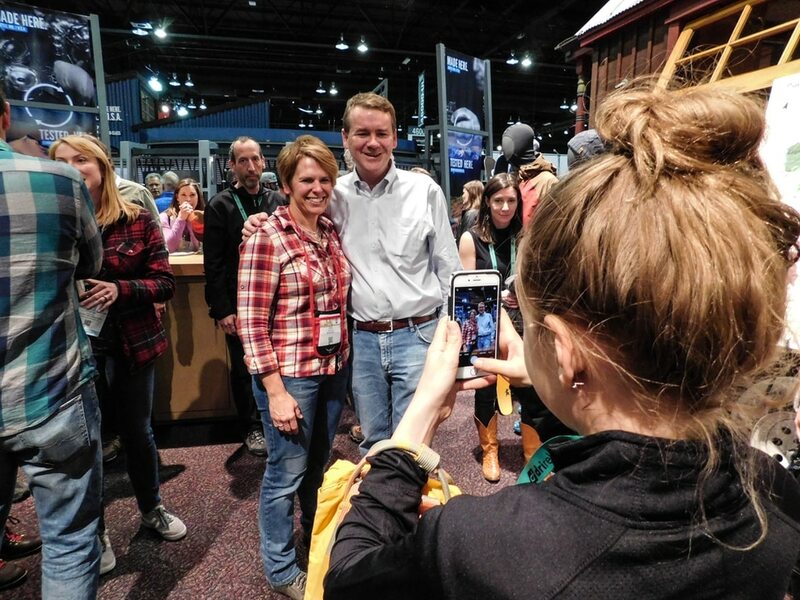 In displays of bipartisanship, Colorado’s Democratic governor, John Hickenlooper, walked the aisles with Wyoming’s Republican governor, Matt Mead, and Colorado’s two U.S. senators — Democrat Michael Bennet and Republican Cory Gardner — visited exhibitors. “It matters a lot; it shows respect,” said Krystle Wright, a brand ambassador for Keen footwear in Portland, Ore.